A terrible danger is looming on the horizon, and Faolan is the only one who knows how to fight it. Will he be able to claim his rightful place as leader and lead his clan in battle? Unless Faolan can inspire the pack to stand together, it could be the end of the wolves of the beyond. Run with the Wolves of the Beyond. Well written and beautifully read. Very enjoyable for young and old alike, grandparents & grandchildren. Please excuse the play on words, as this story isn't scary, although for younger readers, it could be I suppose. This was a very enjoyable read and a nice sequel to "Watch Wolf". 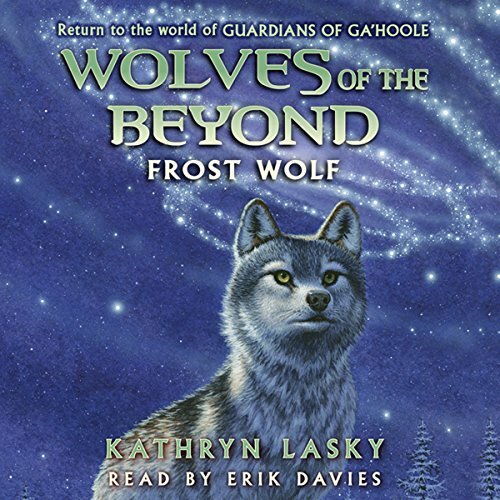 Without giving too much away, let me just say that everything that made the first three books in this series what they were, still remain prevalent within this installment, so if you liked the first three books, you're more than likely bound to find "Frost Wolf" to be satisfactory. Some interesting revelations are revealed in this one, as well as slighty darker themes that are explored but never posed too unreasonably. While some points in the storyline were rather predictable, there were still enough twists and turns to keep things intriguing and enthralling throughout the entire span of the book. It will be interesting to see where Lasky takes this storyline in "Ice Wolf" though but we'll just have to wait and see for that. As always, Erik Davies does a nice job as narrator on this one.